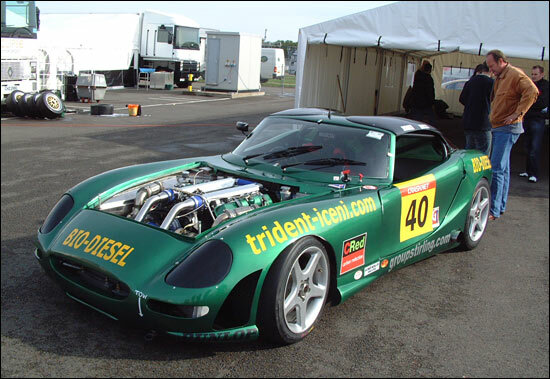 Phil Bevan and his new Trident (diesel-powered) Iceni made a cautious British GT debut last October at Silverstone. He and his team have been very busy during the last three months, and Bevan was pleased to bring us up to date (at the NEC on Thursday). “Turbo Technics have now matched the turbos to the (original) Hummer V8 engine, and we’re seeing the power we expected from that one. “But we’re going to replace the original 6.5 litre diesel with a 6.6 litre Duramax engine, still a V8 diesel, but this one has three valves per cylinder. “We’ve spent a year developing the (automatic) gearbox, so we’ve now got traction control and blip-throttle on the gear changes. The road car project is running alongside the race car, and Phil Bevan reports that the first road car will be delivered in March. Here's the Iceni, last October at Silverstone.